Managing Risks in Business is a video presentation. Length: 24 minutes. Managing Risks in Business, a 24-minute Proven Practices presentation, is designed for both large and small companies that wish to create a structured approach to preparedness, response, and recovery from a critical incident. Presenters Jerome P. Miller and Radford W. Jones discuss how to develop and train an Incident Management Team (IMT) to protect a private sector company during a critical incident. Critical incidents may be the result of a natural disaster or a criminal act, including a terrorist attack. The presentation addresses the structure, responsibilities, and activities of an IMT and outlines the components of a critical incident management plan. It also addresses communication between the IMT and public sector emergency response agencies. Executives, security and risk management leaders, contingency planners, and operations managers can benefit from the practices described in this presentation, which can be used for professional self-development or group training. Jerome Miller has served as a commander in the Detroit Police Department and as the senior manager of international and special security operations at Chrysler Corporation. Radford Jones is the former manager of global security and fire protection at Ford Motor Company and spent 20 years in the public sector with the U.S. Secret Service. 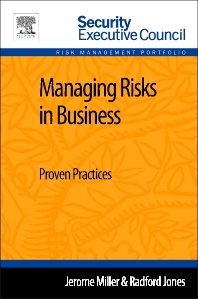 Managing Risks in Business is a part of Elsevier’s Security Executive Council Risk Management Portfolio, a collection of real world solutions and "how-to" guidelines that equip executives, practitioners, and educators with proven information for successful security and risk management programs. What Is Critical Incident Management? What Is an Incident Management Team (IMT)? What Is a Corporate Crisis Management Team (CMT)?